Amy Irvine McHarg featured at Arroyo’s Dec. 2nd at 6 p.m. 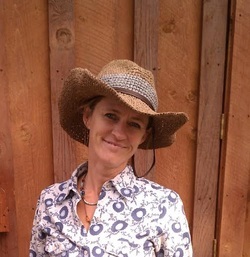 The Telluride Institute presents Wright’s Mesa author and poet Amy Irvine McHarg as Talking Gourds guest performer for Tuesday, Dec. 2nd at 6 p.m. at Arroyo’s. Winner of the Colorado Book Award for Trespass: Living at the Edge of the Promised Land, Amy has non-fiction work in national journals (Orion, Triquarterly, High Desert Review) and she is founding director of Telluride’s Literary Burlesque show. Her chosen theme for December is “Descent Narratives – Down the Rabbit Hole We go.” This next year we will partner with the Montrose Library and bring poets for First Tuesdays in Telluride and First Wednesdays in Montrose. We hope to have a full schedule out this month. As always, following Club announcements and performances, we’ll have a short break and then pass the gourd around the room to give Club members and attendees a chance to read poems from the monthly theme -- pieces of their own or the work of a favorite other. Talking Gourds Poetry Club is a program of the Telluride Institute in partnership with the Wilkinson Library, Between the Covers Bookstore, Arroyo Telluride and the newly formed Telluride Literary Arts. Members meet monthly, on first Tuesday evenings, at Arroyo Fine Art Gallery & Wine Bar at 220 E. Colorado Ave. (next door to Telluride Hardware and the Masonic Hall), beginning at 6 p.m. in Telluride, Colorado. TLA also sponsors the annual Telluride Literary Arts Festival the weekend before Memorial Day weekend.